All historians have agreed that the Egyptians were the first to calculate time. They divided the year into 12 months, according in their knowledge of the stars. They later discovered the solar year, and became dependent upon it. Each of the 12 months was 30 days long and they added five more days, which they called the small month. Therefore, their year became 365 days long. The final stage of rectifying the calendar, in 238 BC was to add a sixth day to the small month every four years. The beginning of their year was on the first day of the month of Thout, which is the first month of the Coptic year. 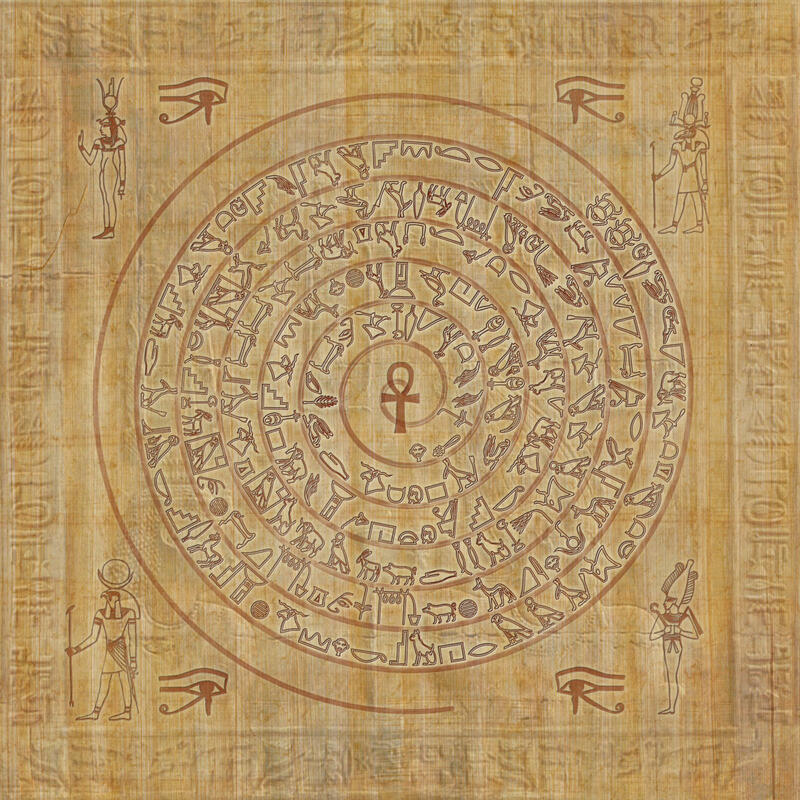 Above: A cosmic spiral of ancient Egyptian hieroglyphs. The season of reaping and harvesting (Pachons to Mesori) The small month was a chance for feasts and festivals. Named after the god Tegot, Tut or Tuhout, who is the god of wisdom, science, art inventions and divine mysteries for the Egyptians. Gregorian Calendar equivalent: September 11 to October 10. Named after Yee-pee or Ha-pee, the god of the Nile or of Thebes, who is also the god of vegetation, because in this month the face of the earth becomes green with vegetation. Gregorian Calendar equivalent: October 11 to November 9. Named after Hator or Hatho, the goddess of love and beauty, because during this month the lands become lush and green. Gregorian Calendar equivalent: November 10 to December 9. Named after Ka-Ha-Ka, the god of good, who is the sacred bull Apis. Gregorian Calendar equivalent: December 10 to January 8. Named after the god Amso or Khem, who is a form of the God Amoun-ru, the god of Thebes in Upper Egypt; he is the god of the growth of nature because much rain falls during this month. Gregorian Calendar equivalent: January 9 to February 7. Particular to the genius of wind, because the storms and wind occur much during this month. It is the month in which the summer heat begins. Gregorian Calendar equivalent: February 8 to March 9. Named after the god Mont, which is the god of war. During this month the temperature is high and thus the Egyptians called it the month of the sun. Gregorian Calendar equivalent: March 10 to April 8. Named after Renno, the god of severe wind or death. During this month the season of vegetation ends and the earth becomes dry. Gregorian Calendar equivalent: April 9 to May 8. Named after Khonso, the god of the moon, on of the Thebic trinity and the son of Amoun-Ru and Mout. Gregorian Calendar equivalent: May 9 to June 7. Named after Khenti, on the names of Horus or the sun. It means “the god of metals”. Gregorian Calendar equivalent: June 8 to July 7. Named after Api-fee or Abib, who is the big serpent which Horus (the sun), the son of Osiris, killed to revenge for his father. Gregorian Calendar equivalent: July 8 to August 6. Particular to the birth of the sun or what is known as the “summer shift”. Gregorian Calendar equivalent: August 7 to September 5. It has 5 days in three successive years and 6 days in the leap year. Gregorian Calendar equivalent: September 6-10. NOTE: The above Gregorian Calendar equivalents may change slightly in a leap year.